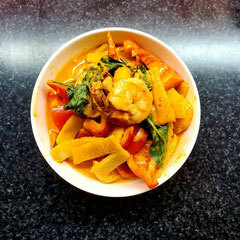 Coconut milk in a Thai red curry sause with prawns, bamboo shoots and peppers Flavoured with Thai basil. 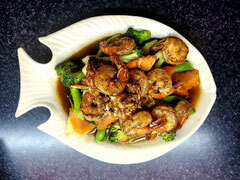 Prawns sautéed with garlic sauce on a bed of broccoli, snap peas and carrots. Prawns sautéed with peppers, onions, chilies and fresh basil leaves. 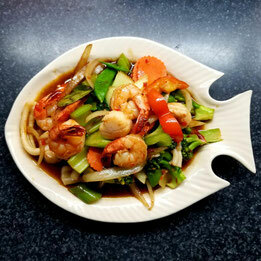 Prawns, scallops and squids in sweet chilli sauce stir-fried with seasonal vegetables, onions, lemon grass, kaffir lime leaves and Thai basil. 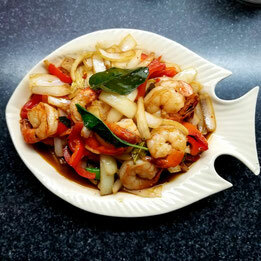 Prawns, scallops and squids sautéed with peppers, onions, fresh Thai basil and chillies. 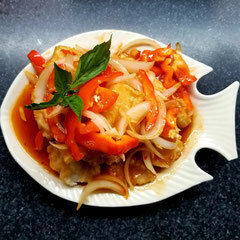 Red snapper in a crispy batter smothered in lightly caramelized garlic, sautéed with onions and peppers. 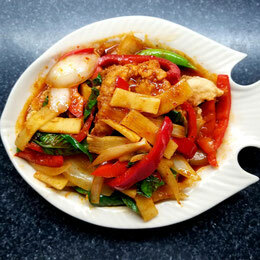 Flavoured with our signature sweet and sour chilli sauce. Deep fried fish balls sauteed with bamboo shoots, peppers, snap peas, Thai basil and kaffir lime leaves, spiced with Thai red curry sauce. Red snapper in a crispy batter, coated in lightly caramelized garlic, sauteed with bamboo shoots, peppers, snap peas, Thai basil and kaffir lime leaves, spiced with Thai red curry. 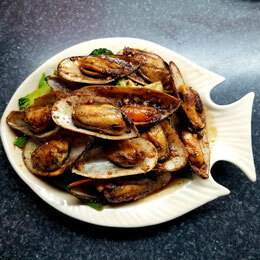 Mussels sautéed with garlic sauce on a bed of broccoli, snap peas and carrots.